Is Pres. Obama making U.S. relations with Israel worse? 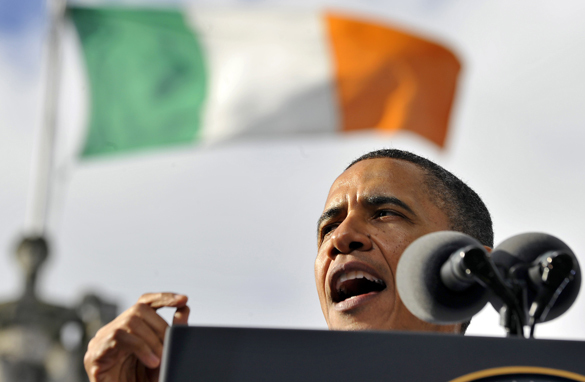 President Obama was in Ireland today, the first leg of a six-day trip to Europe. And as he travels to Britain, France and Poland, U.S. tensions with Israel and the overall instability of the Middle East will likely be a theme. The president's still trying to navigate around comments he made in a speech last Thursday, suggesting peace talks between Israel and the Palestinian people should begin with the borders established before the 1967 war, in which Israel captured Gaza and the West Bank. Palestinians claim some of that land is theirs. President Obama’s suggestion angered the Israelis and created an uncomfortable meeting between President Obama and Israel's Prime Minister Benjamin Netanyahu on Friday at the White House. Sticking with the pre-1967 borders has been a long-held, but not often-stated, U.S. position. Yesterday, the president spoke before the American Israel Public Affairs Committee, Washington's most powerful pro-Israel lobbying group, in an effort at damage control. He reiterated that peace talks between Israel and the Palestinians should begin with the pre-1967 borders, but only as a starting point. Land swaps could eventually be part of the plan in order to be fair to both sides. Netanyahu is addressing the same group tonight. President Obama has said he's trying to jump-start peace talks between Israel and the Palestinians to slow the growing momentum for a declaration of a Palestinian statehood at the United Nations in September. The president hopes to persuade his European counterparts to vote against it. But tensions between the two long-time allies remain high, and the rhetoric coming from Israel has gotten much sharper. Here’s my question to you: Is President Obama making U.S. relations with Israel worse? Is Israel looking to start a war? It's no wonder Pres. Obama's hair is turning gray... With the Middle East seemingly on the verge of erupting. The U.S. continues to stand by Israel, which is coming under tremendous international condemnation for that botched, deadly raid on an aid flotilla headed for Gaza. Details of the attack on the Turkish ship are still fuzzy. Israeli Prime Minister Benjamin Netanyahu is defending the raid which left nine dead; he says Israel's troops were met by a "vicious mob" and that they were stabbed, clubbed and fired upon. The ship carried 10,000 tons of aid including wheelchairs, notebook paper and water purification systems. 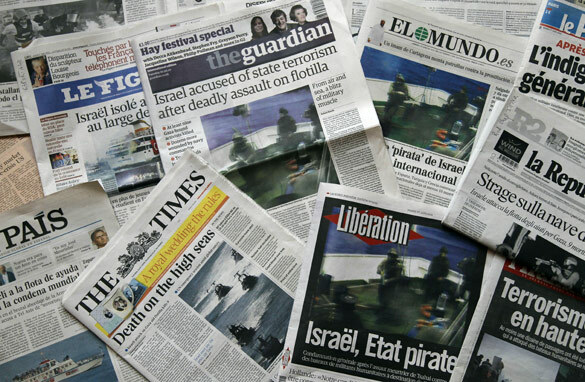 The leader of the group that organized the flotilla says Israel used excessive force on unarmed civilians. The U.N. has condemned Israel. Turkey, which is Israel's' top ally in the Muslim world, is calling it a "bloody massacre," and describes Israel's actions as "murder." The U.S. is walking a fine line here... trying not to anger Israel or the Arab world. Good luck. The White House says it's sorry for the deaths but is not condemning Israel's actions. Tensions are already running pretty high between the U.S. and Israel, and this will undoubtedly only further complicate peace talks in the Middle East and the push for sanctions against Iran. And the raid raises questions about Israel's ongoing blockade of Gaza... it insists the blockade is meant to stop Iran from sending weapons to Hamas in Gaza. But critics want the blockade to end now. Meanwhile this story is far from over - with another ship with humanitarian aid due to arrive in Gaza later this week. Israel says it will stop that one too. Here’s my question to you: Is Israel looking to start a war? How should the U.S. change its Israel policy? Both sides insist the bond is unshakable... but it's pretty hard to ignore the rising tensions between the U.S. and Israel these days. 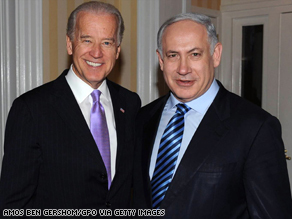 Israeli Prime Minister Benjamin Netanyahu with VP Joe Biden in March. Netanyahu met with Pres. Obama later that day. Now Pres. Obama is signaling a shift in American policy in the Middle East... by declaring that the Israeli-Palestinian conflict is a "vital national security interest of the United States." He's drawing a direct link here between what's happening in Israel and the safety of U.S. troops fighting Islamic extremists in the region. The New York Times reports the president's shift in tone reflects a debate within the administration over how to "best balance support for Israel against other American interests." It's no secret that the administration has been frustrated with a lack of progress in peace talks; and that they were not happy with Israel's recent snub of announcing a massive new Jewish housing project while Vice President Biden was in Israel. That was reportedly followed by a tense meeting between the president and Prime Minister Benjamin Netanyahu in Washington. Israel's right-wing government is concerned that the U.S. will try to push through a peace deal on its own, meaning they'd have to give up things they don't want to; and that the Palestinians might declare statehood unilaterally as early as next year. To that end - Israel has spent much of the last week highlighting threats it faces in the region... from a potentially nuclear-armed Iran to charges that Syria is providing weapons to Hezbollah guerillas in Lebanon. Syria says it's not true. Here’s my question to you: How should the U.S. change its policy toward Israel? Time for the U.S. to get tougher with Israel? With diplomatic tensions rising, both the U.S. and Israel are trying to tamp down the flames. Secretary of State Hillary Clinton now insists the two allies enjoy a "close, unshakable bond." 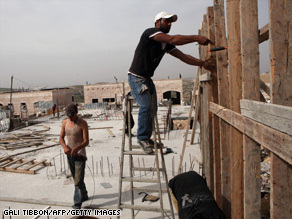 Palestinian laborers work on a construction site in east Jerusalem. VP Biden has criticized Israel's decision to approve construction of 1,600 new homes for Jewish settlers in east Jerusalem. But when Israel announced it was going ahead with the building of more settlements over the objections of the United States and when they chose to make the announcement while Vice President Joe Biden was visiting Israel, Mrs. Clinton called Israel's actions "insulting" to the United States. Which they clearly were. In a game of cover your whatever, the Israeli ambassador to the U.S. now denies making statements that relations between the two countries are "in a crisis." But whatever state relations are in, it ain't good. 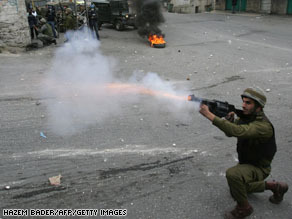 Some are suggesting it's time for the U.S. to get tougher with Israel. One Middle East expert wonders if the flare-up between the two countries means the Obama administration is seeking "regime change" in Israel. Want to really get tough and send a message? Start cutting back on the approximately $2.5 billion in aid we give Israel every year. In Today's New York Times, columnist Maureen Dowd quotes one Obama official, saying, "that's not how you treat your best friend," when describing Israel's recent construction announcement of 1,600 more homes in the disputed east Jerusalem. In her piece called "Bibi's Tense Time Out," Dowd writes the White House is "appalled at Israel's self-absorption and its failure to notice that America is not only protecting Israel from Iran, fighting wars in Iraq and Afghanistan, but also dealing with a miasma of horrible problems at home." Here’s my question to you: Is it time for the U.S. to get tougher with Israel? Obama reaching out to Muslims at expense of U.S./Israel relationship? In reaching out to the world's one and a half billion Muslims with today's historic speech, it's unclear if President Obama is also pushing away America's long-time ally Israel. Speaking in Cairo - the president recognized the U.S.'s unbreakable bond with the Jewish state and the horror of the Holocaust, but also talked about the suffering of the Palestinian people. He described their situation as intolerable and stressed the need for a two-state solution. President Obama called on Palestinians to abandon violence - pointing to America's own civil rights history and saying it was a "peaceful and determined insistence" that brought about equal rights. And, he once again called on Israel to stop building settlements; and to allow Palestinians to live and work and develop their society. Israeli Prime Minister Benjamin Netanyahu has already rejected President Obama's call for a settlement freeze. 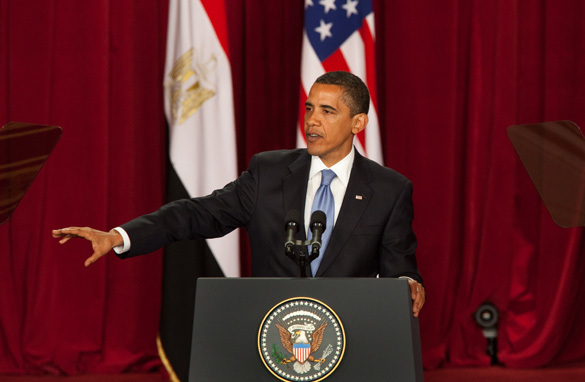 But experts suggest that this demand from Mr. Obama will make Arab leaders listen. They say although the U.S. has been opposed to Israeli settlements for decades, past American presidents have allowed Israel to keep building them. And some believe that if "no" really means "no" this time around, it may be easier to form a regional coalition against Iran. Speaking of Iran - Mr. Obama repeated his belief today that the Islamic Republic has the right to develop nuclear power for peaceful purposes - another statement that is probably not sitting too well with the Israelis. Finally, for the first time in a long time, a visit to the Middle East by a sitting U.S. president did not include a stop in Israel. Here’s my question to you: Is Pres. Obama reaching out to Muslims at the expense of America's relationship with Israel? Should Israel attack Iran's nuclear sites? Iran is warning Israel not to attack its nuclear facilities - with one top official saying if Israel attacks, "Iran will respond in a way that they will not be able to sleep easy anymore." This warning comes a day after Iranian President Mahmoud Ahmadinejad raised tensions between the two countries, calling Israel the "most cruel and repressive racist regime" at a UN conference in Geneva. 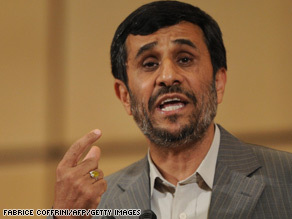 Iranian President Mahmoud Ahmadinejad is pictured at the UN review conference on racism in Geneva. 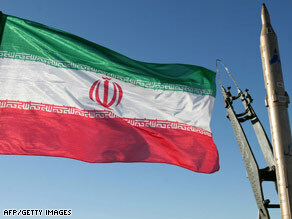 EU delegates walked out of the conference after Ahmadinejad launched a verbal onslaught against 'cruel' Israel. Israel, which is now being led by Prime Minister Benjamin Netanyahu's hardline government, says Iran is developing nuclear weapons that could threaten its very existence. Last week Israeli President Shimon Peres dismissed the idea that Israel is planning any kind of attack on Iran's nuclear facilities. One senior defense official tells the Times that Israel wants to know they could strike Iran within a matter of days or "even hours" if given the green light. It's believed Israel would need to hit more than a dozen targets, including moving convoys. 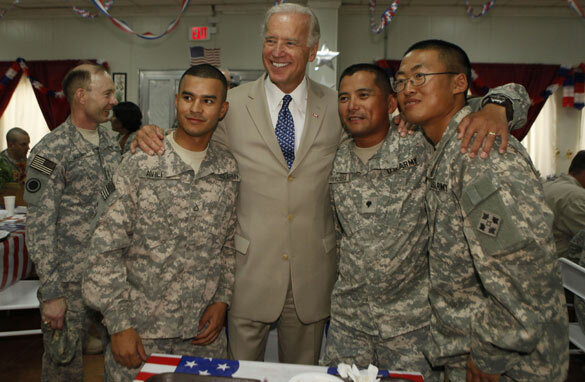 The same official adds that it's unlikely Israel would bomb Iran's facilities without getting at least tacit approval from the U.S. Vice President Joe Biden recently told CNN that Israel would be "ill-advised" to attack Iran. Here’s my question to you: Israel is reportedly getting ready to attack Iran's nuclear sites. Should they? If Iran close to getting nuclear weapon, what should Israel do? There's a growing sense that Iran is getting closer and closer to making a nuclear weapon - and someone may soon have to stop them. An Iranian flag flutters next to a ground-to-ground Sajil missile. Iran has boasted in the past of developing new weapons systems only to be met with skepticism from Western defense analysts. Israel is now saying that Tehran has mastered the nuclear technology to make a nuclear bomb, with Israel's military intelligence chief saying "Iran has crossed the technological threshold," adding that the country continues to amass low enriched uranium. He says the Islamic republic is using expected talks with the U.S. and the West to buy time to get enough uranium to build a bomb. The spy chief also says that even though Iran has mastered the technology, it still hasn't made a nuclear bomb and is probably still a couple years away from doing so. This would suggest they could be stopped before getting their hands on a nuclear weapon. And Israel just might be the ones to stop them. A recent report by U.S. experts suggest Israel is seriously considering taking unilateral action to stop Iran from getting nuclear weapons. The report says Israel's time frame for action is getting shorter due to Iranian advances and the possibility that they will upgrade their air defenses to give their nuclear program a further reach. The report argues international sanctions as well as financial pressure be increased. Meanwhile Iran has just announced that it successfully tested a new air-to-surface missile. Nonetheless, they continue to deny they're seeking nuclear weapons. Here’s my question to you: If Iran is now close to obtaining a nuclear weapon, what should Israel do? 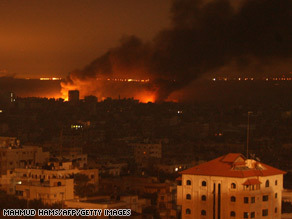 Gaza Conflict: Is Pres.-Elect Obama's Silence a Mistake? It's been ten days since Israel launched attacks on Gaza. Since then, President-elect Barack Obama has remained silent on the conflict. As an excuse, Obama is sticking to what he said right after the election, that there's only one President at a time and therefore it's up to President Bush to comment. He was even asked about it today and continues to say that he won't say anything. Two of Obama's closest lieutenants, Joe Biden and Hillary Clinton have also managed to remain silent. Meanwhile many U.S. politicians have backed Israel. Obama's critics are saying he isn't doing himself any favors with his silence. The Guardian newspaper says that as each day passes hopes are diminishing that Obama will make a fresh start in U.S. relations with the Muslim world and that he is losing ground with Muslims and Arabs. Al-Jazeera television showed video of the President-elect vacationing in Hawaii juxtaposed with video from Gaza. Here’s my question to you: Is President-elect Obama making a mistake by remaining largely silent on the situation in Gaza?